In South Africa, we call it collision government. More magic available at www.zapiro.com. Aren’t spin-doctors wonderful? Imagine the ANC talking about “unity”! When the self-evident truth is quite otherwise: the score is tied. From now on, shall we change the sports terminology to Win, Lose, or Unity? Question: Did you hear what Mickey Mouse got for his birthday this year? Answer: He got an ANC watch! 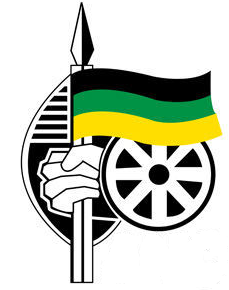 Starting with the way the ANC counts votes of its own party delegates, this is the mickey-mouse party! They may end up facing a total recount, or just a partial recount, because of all the internal allegations of vote rigging. Not to mention the vote-buying that both sides accused the other of in the run-up to the elective conference. First there is the “two centres of power” conundrum. Zuma stated in 2016 on a radio talk show that the President of the Party should also be the State President. Now he is back-tracking. The truth is that in most countries a clear distinction is made between these two roles. Even the DA in South Africa has James Selfe and Mmusi Maimane. Two centres of power is a good thing – unless you still believe in that old Soviet Socialist myth of a Vanguard Party. But South Africa is a Constitutional Democracy so letting one person occupy both posts is like having two accelerators and no brakes! No wonder we end up with a Super-president, with a bloated Cabinet, with Parliament on a leash, and with a run-away train called State Capture. We need two centres of power. And we can’t escape that now, because even if Zuma resigns or is pushed out you have his cronies Mabuza, Magashule and Duarte among the Top Six. You can’t change a leopard’s spots. This is the latest manifestation of the Premier League. Brought to you by Jacob Zuma. That is not a united front! That is a split. It happens in Democracies – like when the Democrats won the White House (i.e. executive branch) but the Republicans won both the House and the Senate. Ask Barack Obama! Did they call that “unity”. No, that is the way voters apply the brakes on their politicians. Another manifestation of voters “hedging their bets” is to vote one party in at national level and other parties in at Municipal level. This is happening because voters are not just cannon fodder for the ANC. They know about Deployment and how it is abused by the crony capitalists. Who then invent slogans like “radical economic transformation” like a wolf wearing a sheepskin. 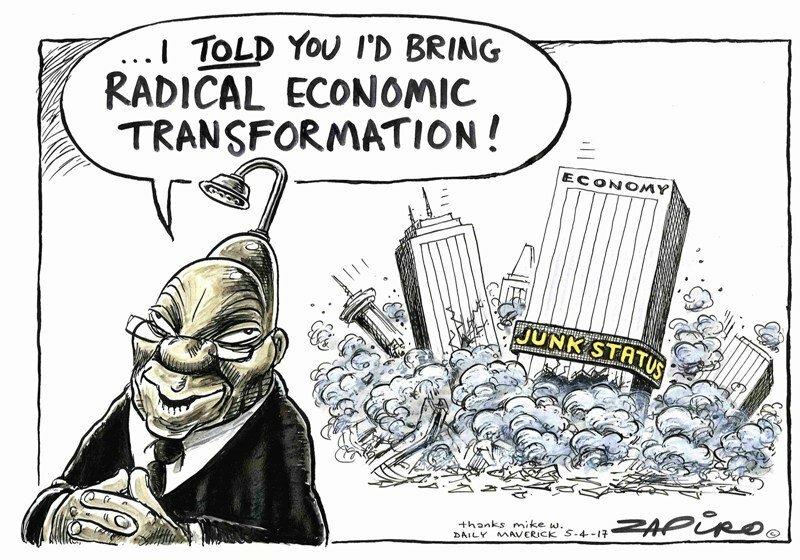 President Jacob Zuma’s radical economic transformation. More cartoon magic available at www.zapiro.com. We saw this already in Venezuela – socialist rhetoric being the Mask for looting and plundering by crony capitalists. Once bitten, twice shy. The voters are aware, thanks to the Media and the open “lawfare” of Civil Society. Voters know that we need two centres of power. In other words – checks and balances. But the real gridlock (a k a “unity”) is coming in 2019! 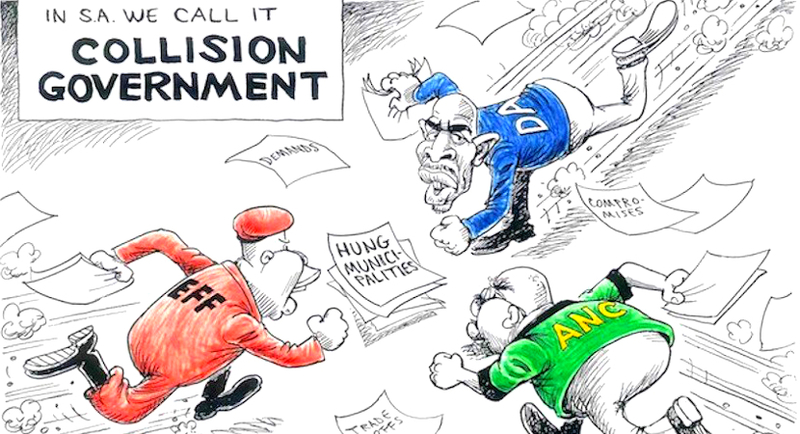 When the voters punish the ANC and Coalition forces take over government, you are going to see the blue DA, UDM, COPE, ADeC and Agang join hands with the red EFF, SACP, NUM Labour party, COSATU and SAFTU – in a show of “unity”. If a split Top Six can make it work, why can’t the reds and the blues call it “unity” as well? If the Zuma “triumphalists” can get along with the Ramaphosa “reformers”, then even the COSATU-sheviks could reconcile with the SAFTU-sheviks. 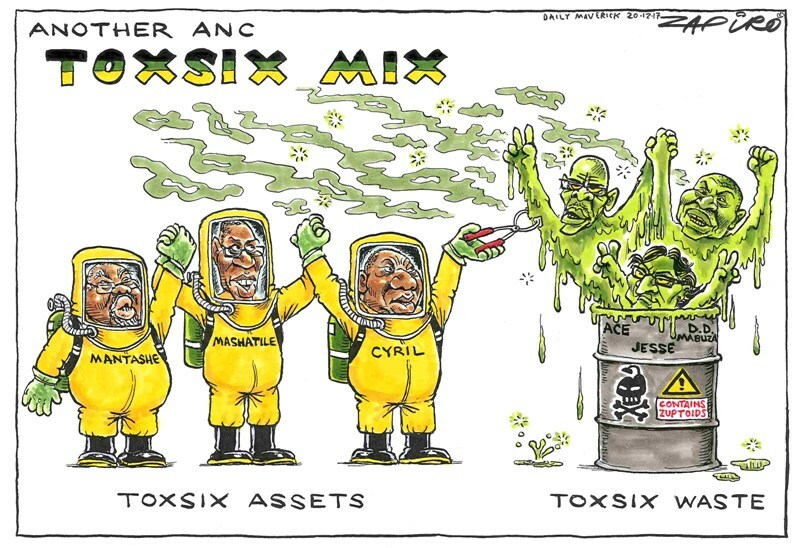 Another ANC Toxsix Mix. More of Zapiro’s magic available at www.zapiro.com. There is talk that the Mandela magic has fallen on UDM leader Bantu Holomisa to preside over this new “unity” project. With two deputy presidents – Maimane and Malema. Just think of the Cabinet potential for such a coalition, with big names like Lekota, Nzimade, Makhosi Khoza, Ndlozi, Ramphele, Shivambu, Mashaba, Jim, Msimanga, Vavi, Trollip, Mapaila, Zille and Ntshalintshali. There is a Vision of “unity” if there ever was one! If you really think this Red & Blue Coalition could work, then believe the ANC spin-doctors when they talk about “unity”! Chuck Stephens is Executive Director of the Desmond Tutu Centre for Leadership. He has written this in his own capacity.